Today we’re surrounded by media everywhere we look. There’s the internet, TV, film, radio, magazines, papers… the list goes on. Not only is Media Studies interesting and relevant, it gives you valuable skills to help understand the world around you. You can apply many of these skills to GCSE English too. In Media Studies, we cover texts from a wide range of media. From the still provocative documentary of the 9/11 tragedy to up-to-date Television comedy of QI and The Big Bang Theory. This is supported with study of culturally significant examples from the dawn of cinema and the moving image such as the Lumiere Brothers. Media Studies is creative, challenging and promotes a co-operative approach to study. 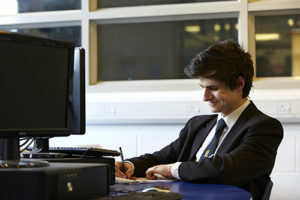 Students are expected to work effectively within an environment that requires a responsible attitude to using the Media Department’s technical equipment. Housed in its own wing of the refurbished Manor, digital video editing and sound mixing are created using high-spec Macs while having access to all other resources shared jointly with Art. English: Media works well in combination with the core subject of English, with a direct correlation between English Language study of non-fiction texts. Media can give you a head-start with understanding how digital texts such as websites and blogs are presented and designed. Art: With its emphasis on recording the progress of film and design work, Media could be useful for students taking Art with sketched storyboarding and draft-work a required element of production folders. Music: There are opportunities to develop your skills in music and sound mixing using GarageBand with previous music students importing their own compositions for use in their film productions.